1) Statement: Statement interface is used to execute normal SQL Queries. 2) PreparedStatement: It is used to execute dynamic or parametrized SQL Queries. 3) CallableStatement: It is used to execute the Stored Procedure. 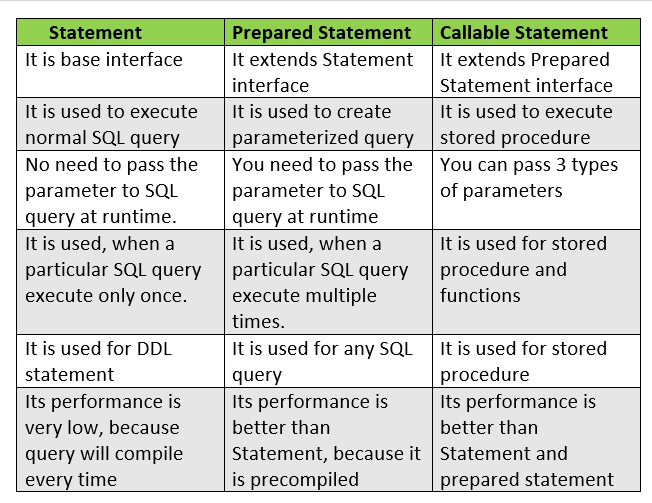 In this post, we will discuss the differences between Statement vs PreparedStatement vs CallableStatement in detail. In JDBC Statement is an Interface. By using Statement object we can send our SQL Query to Database. At the time of creating a Statement object, we are not required to provide any Query. Statement object can work only for static query. Whenever we are using execute() method, every time Query will be compiled and executed. Because Query will be compiled every time, its performance is low. Best choice for Statement object, if you want to work with multiple queries. PreparedStatement is an interface, which is available in java.mysql package. It extends the Statement interface. PreparedStatement is faster then Statement interface. Because in Statement Query will be compiled and execute every time, while in case of Prepared Statement Query won't be compiled every time just executed. In case of Prepared Statement no chance of SQL Injection attack. It is some kind of problem in database programming. CallableStatement in JDBC is an interface present in a java.sql package and it is the child interface of Prepared Statement. Callable Statement is used to execute the Stored Procedure and functions. Similarly to method stored procedure has its own parameters. Stored Procedure has 3 types of parameters. 1) IN parameter: IN parameter is used to provide input values. 2) OUT parameter: OUT parameter is used to collect output values. 3) INOUT parameter: It is used to provide input and to collect output values. 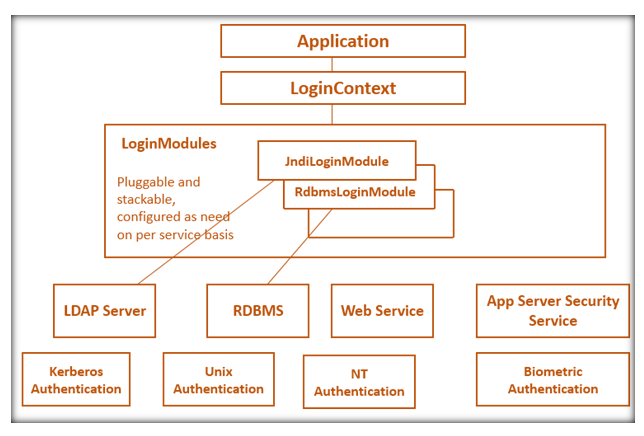 The driver software vendor is responsible for providing the implementations for Callable Statement interface. If Stored Procedure has OUT parameter then to hold that output value we should register every OUT parameter by using registerOutParameter() method of CallableStatement. CallableStatement interface is better then Statement and PreparedStatement because its call the stored procedure which is already compiled and stored in the database. let's take an example, I created a stored procedure called addpro() which can take 2 input values and provides the addition of 2 number as an output. Here I will call the stored procedure addpro() and set the input values by setter method and execute the stored procedure. This procedure will give the addition of 2 numbers.